Not one of my better efforts, I think, but there are bits of it I like. It started out to be funny, developed a serious side, and I was never able to get the elements to blend the way I wanted them to. Grumble grumble. It’s always pleasant to run into someone who liked this book; it means that I can still do all right when I’m not on my game. Jut thought I’d add that I’ve always had a soft spot for this book….I know what you mean about things didn’t quite gel the way you probably would have liked, but I liked this one anyway. Thanks kindly; that’s pleasant to hear. Glad it to know it was fun, even if not what I was shooting for. Cowboy Feng’s was the first Brust book I read. I love, “I laughed, I cried, I fell down. It was good,” and I thought the characters were great. I should reread it. I liked it. Thought about it just the other day, too, when I purchased some truly amazing matzo ball soup at a local deli. I was sick, and it was magic. It was also part of a rather complicated good deed. Maybe that increases the healing power of the soup. I will have to ask either a Jewish witch or a really good Jewish cook. This has always been a favorite of mine. Haven’t read it in about five or six years, mostly because it’s in one of the many boxes of books in the root cellar. Not nearly as much bookshelf space as the last house…. I always liked it, too, even through three or four re-reads. I don’t remember when I twigged to the fact that the same guy who wrote this was the one who wrote the Dragaera books. D’oh! I bought Feng’s on iBooks a while back and discovered that Michael Flynns text for “the Wreck of the River of Stars” was attached. Not a bad read but not the book I was looking for. I got copies Erik. Minicon? Also, that’s a great idea. I really enjoyed this book. So much so that I finished it in one sitting. Something about it just tickled an itch that I had at the time. I even recommended it to my wife who also thought it was great. Thanks for writing this one. I think I even own two or three copies of it. Ha, ha!! Definitely one of my favorite books! I haven’t read your other books, Mr. Brust, but I’ve kept this one on my shelf for the last 24 years. I like the food, I like the intermezzos, I like what you write about love, and I like the idea of critical points in our personal histories where everything changes. Thanks for writing the book. I read it during my own intermezzos. Thank you, Mary. That’s delightful to hear. I picked up your book, once upon a time, for just a few bucks in a discard bin at the library. It was old, battered, much dog-eared, but something about it caught my eye. I picked it up, and it changed my life. YOU changed my life. I make every single one of my friends who has the respect to call themselves a reader, read it. I recommend it to everyone I can, then reread it myself whenever my fingers are itching and my hope is low. Someone actually liked the book so much they stole my copy! 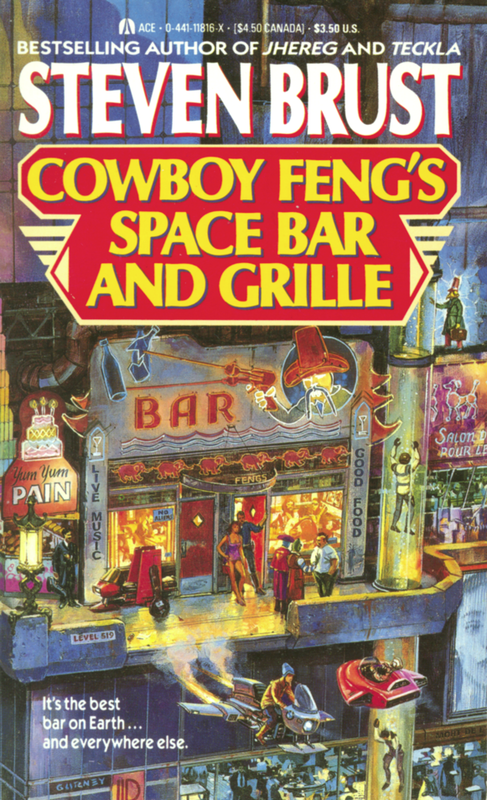 I was surprised to find on here that out of all your books (which I now need to stock up on), Cowboy Fengs was one of your least favorite. The story and the characters resonated so strongly with me, that I actually thought that the book had been a GLORIOUS one hit wonder. Words don’t describe how happy I am that i can go find more of your writing, in fantastical genres and worlds I never would have believed possible without your help. From one aspiring author to her huge inspiration… Thank you. Thank you kindly, Sky. That means a lot. As I said above, it’s always especially nice to hear that someone enjoyed that one. Best of luck with your work! This is one of my favorite books to read in the autumn. I bought it brand new, probably in the mid-90s. I find the book highly enjoyable and constantly quote it at work, to friends, to family. Everyone looks at me askance when I do. It’s great. Mr. Brust, your work is responsible for assisting with the development of my sense of humor and appreciation of the coffee with cream, sugar and cocoa. I liked the story structure, the characters, the action sequences and the intermezzo’s. I thought it was an interesting way to develop characters and create an overall sense of disorientation. I got the impression Billy was an avatar for the author, especially when he was described with long hair and a mustache during the first encounter with the Physician. I always thought this would make a great television miniseries or at the very least an audio book/radio series (imagine being the narrator; it’d be the highlight of my voiceover career) and I especially enjoyed the Irish songs. Fun fact: as I write this, I’m listening to “A Rose for Iconoclastes.” I’d love to interview you sometime about this book and the music, if you’re keen on such things. Once again, thank you for writing this story and, though it may be an obscurity to some, it means a great deal to me. That’s very nice to hear, and thank you indeed. And, sure, I’m always up for an interview. Great! I look forward to speaking with you. E-mail OK? Cowboy Feng’s was the first book by you I ever read. I found it in a used bookstore, probably not too long after it was out. It may not be your best work, but I will always have a soft spot for it, because it brought me to all your other books. Of course, that also lead to me picking up Orca off a library shelf and it being the first Vlad book I read, which really colors the whole series differently, I think. What is polyamory even FOR if not to gather a wider range of book recs?